When your father, Mark Van Doren, is a Pulitzer Prize–winning poet, as well as a novelist, critic, playwright, editor and beloved teacher at Columbia University, it’s hard to stand out in the literary world. Same goes when your uncle, Carl Van Doren, is a Pulitzer Prize–winning biographer and critic. Same goes when the wives of the men in your family are novelists and editors, too. And when your family home is in Connecticut but you hang out in your Greenwich Village townhouse sometimes with Sinclair Lewis and Mortimer Adler. 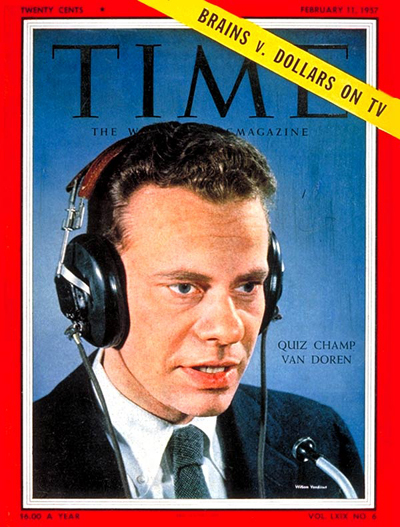 And so it goes that Charles Van Doren, who died Tuesday at 93, felt the need to shine a little brighter than Dad from under that shadow — even with a bachelor’s and master’s, a teaching gig at Columbia, a biography on Lincoln in the works, a pedigree from 17th-century Dutch immigrants and the bona fides of a prominent literary family standing mightily beneath him. Ironically, he chose to create his own legacy by participating in a popular but extremely rigged game show, Twenty-One, that would have him pretend to reel off a staggering wealth of facts so vast that even an Ivy League education and multiple Pulitzers in the family couldn’t quite explain it. The scandal’s exposure would go on to dominate his résumé for life, kill his reputation as an intellectual heavyweight — we might call him a failson — and alter quiz shows forever. Van Doren’s story can be seen in dramatic fashion in the quick and tightly plotted Robert Redford film Quiz Show. It’s a brilliantly interwoven retelling of a son’s need to outshine his father, our country’s conflicted relationship with class and intelligence and our sometimes deeply unethical dark bargain with television’s altered realities. One of the most striking aspects of the film is the way it manages to both sympathize with Van Doren while still holding his feet to the fire. As the viewer, you need to see his comeuppance, yet you’re still left with the sickly feeling that the price he paid was far too high and redemption will never come. What happened, exactly? Van Doren won some $129,000 on Twenty-One during a 14-week stint in 1956 and 1957 (something like $1.5 million today), marveling audiences with his impressive knowledge of minor seas and obscure vice presidents. It happened during a time when game shows such as The $64,000 Question and Tic-Tac-Dough were riveting watching for the majority of television viewers, in no small part because the winnings were so big. Even the losers on The $64,000 Question took home a Cadillac, and some nights, 84 percent of all television sets were tuned in. By 1958, there were 24 different game shows across only three networks. The only problem: Twenty-One was a lie. In order for Van Doren to beat out the existing champion, a Jewish trivia nut from Queens with a sidewall haircut named Herbert Stempel, he’d have to get the answers in advance. Stempel was winning every week for a six-week streak, but ratings were dropping and he wasn’t popular with audiences anymore. The show swore the answers were kept in a vault until just before game time. Van Doren was the perfect blue-blood challenger to defeat the seemingly working-class Stempel (itself a lie, too — Stempel married into wealth), and television feeds on dramatic arcs. Van Doren was unable to resist the opportunity to ride the wave and build his own legend. When producers explained that he’d be coached on the questions and answers, as well as when how to pause, show nervousness and build suspense, Van Doren, in an action he would later describe to a Congressional committee in 1959 as “foolish, naive, prideful and avaricious,” took the deal. While it lasted, though, Van Doren was a celebrity. He made a 1957 cover of Time Magazine and became an overnight sensation. He was just 31. He didn’t own a television. His clean-cut looks, poise and charm made him a natural for television, and his prestigious intellectual lineage made him a perfect candidate to pitch America as home to intellectuals and education as a cause to get excited about. Letters poured into Van Doren from across the globe, thanking him for “popularizing the life of the mind.” But Van Doren eventually tired of forfeiting real intellectualism, so he convinced the producers to release him. Upon exiting, he nabbed an additional $50,000 contract on NBC’s Today show to read poetry and talk history for five minutes a day. But eventually, the jig was up. Stempel decided to go public, along with bitter contestants from other rigged shows who’d been jilted for fresher faces. Rumors swirled for months that many of the shows were rigged. Networks and many contestants denied them. And if Van Doren’s first mistake was agreeing to play a rigged game, his second was insisting it wasn’t rigged in the first place. He, too, kept up a public stance of denial until he was outnumbered. In the film Quiz Show, Van Doren goes to tell his father, Mark, that he’s one of the phonies who got the answers. The exchange is a chilling display of the tensions between a father and son in what it means to claim one’s name: To whom does a surname belong? “Your name is mine,” his father rebukes. I was beginning to realize what I should have known before, that the truth is always the best way, indeed it is the only way, to promote and protect faith. And the truth is the only thing with which a man can live. My father had told me this, even though he did not know the truth in my case. I think he didn’t care what it was so long as I told it. Other people said the same thing, even though they, too, did not know what the truth was. If the 1950s had a cancel culture (outside McCarthyism), Van Doren’s went like this: NBC nullified his contract. Columbia allowed him to resign. He pled guilty to charges of second-degree perjury. He fled New York for Chicago, where he took a job as editor of the Encyclopedia Britannica. He kept writing books, some under a pseudonym. Though some people defended Van Doren and the contestants as mere pawns, the powers that be weighed in against him and he would spend the rest of his life hidden from the public eye. Many of the pieces floating around today about Van Doren’s life remark that the legacy of the scandals remains unclear. But while quiz shows may no longer be rigged with giving out the answers, they’ve simply pivoted toward other methods to up the stakes for drama, and the quiz shows that remain — looking at you, Jeopardy — still perpetuate the false notion that “the spouting of trivia” passes for true intellect in the first place. Herbert Stempel, the contestant Van Doren dethroned at his peril, is 92 and still lives in Queens today. He has always maintained, without a trace of shame, that his knack for retention was legitimate. But one wonders why the public had little appetite for Stempel’s admission — he got the answers too, and was first to play along with the show’s rigging — and what it says about us that we were far more content to see a man from a family of literary giants skulk away in disgrace, without holding anyone else too accountable. Probably because Stempel always had less to lose, and in the end, there is always something more fascinating about falls so far down they can scarcely be measured with our eyes. Van Doren declined to participate in a documentary about the scandals, and also rejected a $100,000 consulting fee from Redford to participate in the movie Quiz Show. And while he may have spent decades away from anything like the spotlight he once sacrificed everything for, he never seemed to forget the purpose of his penance, though he did seem, ultimately, to accept the truth.